Today I’m really excited to have Kevin Williams on the show. Kevin is someone who I met at the Ecommerce Fuel live conference. He was actually one of the keynotes there and I really enjoyed his presentation. Kevin runs the site BrushHero.com where he sells a power cleaning brush that hooks up to your hose and spins with a lot of torque to clean up hard to clean objects like wheels, bikes, boats and more. He was also recently on the hit show Shark Tank. Anyway, the reason why I brought Kevin on the show is to talk about his process for testing products so that he knows it will sell before he spends a lot of development money on a project. Enjoy the show! Note: I apologize for the audio quality on this one. There was something wrong with Kevin’s mic but I guarantee you that the content is good. You’re listening to the My Wife Quit Her Job Podcast, the place where I bring on successful bootstrapped business owners and dig deep into what strategies they use to grow their businesses. Now today I’m happy to have friend Kevin Williams on the show. And Kevin is an e-commerce entrepreneur who was recently on Shark Tank, and he’s making a killing selling power cleaning brushes online. And the main reason I brought him on the show is because he has an excellent process of testing products so he knows whether they will sell before he spends a lot of money. But before we begin, I want to give a quick shout out to Privy who is a sponsor of the show. Privy is the tool that I use to build my email list for both my blog and my online store. Now what does Privy do? Privy is an email list growth platform, and they manage all my email capture forms. And in fact I use Privy hand in hand with my email marketing provider. Right now for example, I’m using Privy to display a cool wheel of fortune pop-up. Basically a user gives their email for a chance to win valuable prizes in our store. And customers love the gamification aspect of this, and when I implemented this form email sign ups increased by 131%. Bottom line, Privy allows me to turn visitors into email subscribers, which I then feed to my email provider to close the sale. So head on over to Privy.com/Steve, and try it for free. And if you decide you need some of the more advanced features, use coupon code MWQHJ For 15% off. Once again that’s P-R-I-V-Y.com/Steve. Now I also want to give a shout out to Klaviyo who is also a sponsor of the show. Always blessed to have Klaviyo as a sponsor because they are the email marketing platform that I personally use for my ecommerce store, and I depend on them for over 30% of my revenues. Now Klaviyo is the only email platform out there that is specifically built for ecommerce stores and here is why it’s so powerful. Klaviyo can track every single customer who has shopped in your store and exactly what they bought. So let’s say I want to send an email to everyone who purchased a red handkerchief in the last week, easy. Let’s say I want to set up a special auto-responder sequence to my customers depending on what they purchased, piece of cake, and there is full revenue tracking on every single email sent. Now Klaviyo is the most powerful email platform that I’ve ever used and you can try them for free at mywifequitherjob.com/K-L-A-V-I-Y-O. Once again that’s mywifequitherjob.com/K-L-A-V-I-Y-O, now on to the show. Steve: Welcome to the My Wife Quit Her Job Podcast. 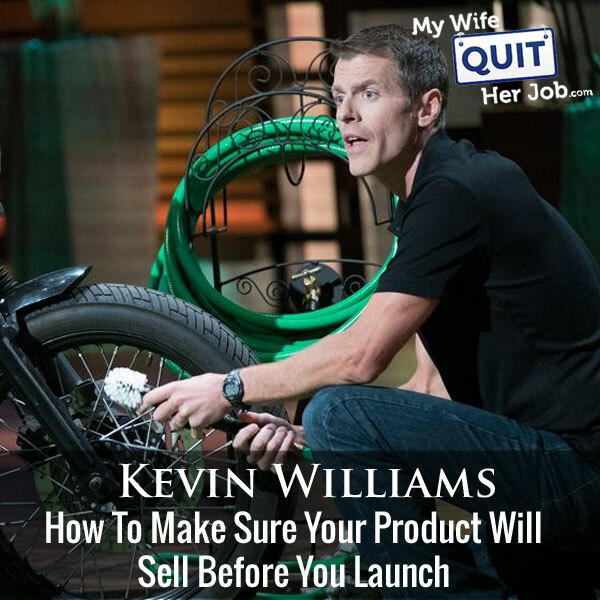 Today I’m really excited to have Kevin Williams on the show. Now Kevin is someone who I met at Ecommerce Fuel Live just a couple of weeks ago actually, and he was actually one of the keynotes and I really enjoyed his presentation. Now Kevin runs the site brushhero.com where he sells a power cleaning brush that hooks up to your hose and spins with a lot of torque to clean up hard to clean objects like wheels, bikes, boats and more. And he was actually recently on Shark Tank literally a couple of weeks ago as well. In any case the reason why I brought Kevin on the show today is to talk about his process of testing products for sale so that he knows something will sell before he actually spends a lot of development money on a project. And among other things he actually does a lot of business. He does retail as well and so we’ll see what where the conversation goes. And with that, welcome to the show Kevin, how are you doing today man? Kevin: I’m doing well Steve, thanks for having me. Steve: So Kevin, you have a pretty interesting history and background, please give the audience a brief overview of how you got into e-commerce in the first place and how Brush Hero came to be. Kevin: I can blame you Steve now by the way sort of, sort of. You were definitely along the path somewhere. I used to be what could best be described as a venture capital mercenary. So angel investors and venture capitalists would hire me to parachute into a company and fix it and prove it, sometimes close it. After a number of years of doing that, I felt that I had recognized that I had built a tool set for being able to test opportunities really, really early as opposed to spending tens of millions of dollars and then ending up closing at the end of the day. So I was looking for ways of deploying what was sort of a derivation of the minimum viable product methodology that Eric Reese and some others were really developing about five, six years ago. And I hit on e-commerce and the beauty of digital marketing and the ability to really toss ideas out there on the internet and very efficiently test them in a short amount of time. E-commerce was an absolutely natural fit for that. I did a little bit of orient into affiliate marketing where we did a lot of rapid product testing of course over there and I was able to apply those concepts in the products. And a former business partner/CEO of mine from my venture days approached me with this brush that he had found in the United Kingdom that had a patent on it and wasn’t really going anywhere over there. So we applied my methodology to it, and up with some quick results through some Facebook advertising and rolled from there. Steve: So I didn’t realize that the product was very developed. Kevin: Yes this is — I’m not an engineer. I like to play one at night but I’m not. Steve: Yes so you stumbled upon this product from your friend in the UK, and you decided whether you wanted to buy them out essentially and bring it to the US? Kevin: Yes so our MO is to generally buy or license patents. We found that there’s just thousands of ideas that are floating around out there. Everyone seems to have one, father in laws, brothers, uncles, whatever aunts who have been doing away at whatever cool utility part in their basement. But most of these people couldn’t market their way out of the box. So I will admit we got sort of lucky with this first patent because it grew really rapidly, but the engineer who owns the patent still does is out of Oxford, England and he’s been working on it for some time. And we license [inaudible 00:06:38]. Steve: I’m just curious, you just go up to the guy and say we would like to license your patent? Like how do you figure out how much it costs and yeah what’s the process there? Kevin: In this case it took a while. There were some things that were happening before I was involved. My partner returned the product. He’s a big car guy and has like a fleet of really nice cars that he likes to clean, and he was looking for a solution to his own problem. He had found this product in the UK. He bought one and said, wow this is really cool, and then he tried to buy another one from someone and he couldn’t find it. So he tracked down his original order, gave the guy just a cold call, and started talking about it. That call led to the idea of possible US distribution etcetera, and then I stumbled into the picture to basically run the thing. Steve: What are the terms of such a deal look like; I’m just kind of curious? I mean you don’t have to give exact numbers, but I’m just kind of curious like what the royalties look like. Kevin: So we pay a royalty on gross sales that are related to the core intellectual property of that particular product. It’s around 4 to 5% is what we usually pay on the primary product. If we develop a secondary product based on that intellectual property that royalty drops to 2, 2.5% depending on the product. But we always make sure that we lock up full on global rights to whatever we’re going to invest in. So we have the exclusive global rights to the underlying IP of this product basically forever. Kevin: That’s sort of a sensitive subject; it’s not so Mr. Wonderful. Kevin: But yes we do form partnerships though with our inventors. We like to keep them involved and they’re incentivized to continue to develop products. And we generally end up with a first right of refusal for those products as well. Steve: Okay. So you know that you want to license this and then of course you want to know if it’s going to make money in the US. So, let’s kind of walk through that process of validation. Kevin: Okay so in this case we did have an actual product. So it was a little bit easier. Sometimes we do this sort of testing when we don’t have a product or if we’re just prospecting for intellectual property. Let’s just say a product crosses our desk that we think is cool, we think it might have legs, but we have been known to test products before we have a license or we have any product to sell. In this case we bought a few of them, we imported them. I am an amateur photographer so I set up the light box. I shot some photos of it, I did a couple of quick clips of dirty wheel, clean wheel, then we set up a landing page in the US as just at the time we were using lead pages I believe. And the landing page was dead simple. It was just a sales language about the product, a video, me squatting next to my car cleaning a wheel, some other sales language under it, and a big call to action right in the middle of the page. And the idea is we can then do — set up Facebook campaigns based on a couple of different audiences or ad sets, drive traffic to that lander and determine how many people clicked on that add to cart button. Now once they clicked on the add to cart button, they continued to buy the [inaudible 00:10:11] we had five or six of them. Instead they ended up on a page that said, oh no, all sold out, leave your e-mail here and if you’re interested we’ll sell you one when we actually have them in stock. It’s awesome that we take some people off, sure but we really only directed about eight, nine thousand clicks to this particular lander. What I was looking for was purchase intent based on sort of a half way attempt at marketing. And in this case we had a CTR on the add to cart button of almost 8%. So 8% of the traffic that we drove in our most successful campaign was willing to click on that add to cart button. Now as we all know, there would be a lot of cart lost under there or whatever, but if this is a design that took me just a few hours to put together and I was getting an 8% conversion rate on it, I really know that I have something going on. Steve: So what are your metrics for that, like what is considered a bad conversion rate, what is considered okay, and what is considered excellent for just add to cart? Kevin: It depends entirely on the product. I want to see a bare minimum of a 3% add to cart rate, 8% would be exceptional. I mean I’ve certainly heard of people with higher conversion rates than that, but in our testing that’s one of the highest just add to cart conversion rates that we’ve seen in a seasonal product outside of holidays and special occasions and things like that. Steve: Okay so a 3% add to cart rate would be like considerably lower on the actual purchase rate, so let’s say like a 1% purchase rate is that kind of what you’re shooting for? Kevin: Sure, overall we want to see a 2.5 to 4% purchase conversion. But remember these landing pages we’re putting together are deliberately not — they’re sort of half done. We don’t want to invest too much time or effort into any of these concepts. What I know about myself, and what I know about humans in general is that the more time that they spend on designing, and caring for, and loving a concept, the more they’re going to fall in love with it. And once you fall in love with a concept, it’s really hard to walk away. All of a sudden you start looking at it, oh it’s more than a half conversion rate, maybe that’s good enough, maybe I just didn’t do it right. And it’s hard to be agile and move fast if you fall in love with a product. Steve: So given that Facebook ads tend to perform a lot better with videos, like let’s say you didn’t actually have the physical product in hand, how would your process have differed? Kevin: So we do, do this a lot, usually we don’t have a physical product in hand. If the product doesn’t really exist as in we’re looking at a patent that it has some prototypes, we would make the prototype, we would doctor it using Photoshop. At the time it would have been me, but now we have a graphic designer who does that for us, maybe change the color, add some things in the background whatever it is, and hit the language a little bit harder. You know video does perform better on Facebook; we’re very solid on video advertising. In fact we always look for products that have some sort of geniality to them like in the case of the brush, the wheel is dirty, then it’s clean. We have a have a cooking line, there’s the patent holder there. It’s actually one of the White House cook, and he’s a guy who’s full of personality. So on video he can really be full of life and really be presenting the product quite well. But without video you may be looking for a slightly lower conversion rate. So when I give my range, if I don’t have video I may be looking for something more like a 3% versus 5 or 6%. Steve: Okay and so I guess the whole process is kind of like an art form right depending on what you have and how you feel the Creative is, you expect different CTRs for this experiment. But I guess the whole point really is just kind of the idea of the overall interest and your gauge to see if you want to push forward with the idea? Steve: Absolutely and it’s not rocket science and there’s nothing really new. I think that our spin on it is moving really, really fast with it and adding a level of rigor to it. So I literally write down what my goal is and that goal can change from product to product. But what I feel in my gut is going to make me feel like this is could be a good product, it could be three, it could be 5%. I write that down on a piece of paper, I stick it in an envelope; I stick it on my desk piled and all the other things that are piled up here. And then after the test, I open that envelope up and I try and be as intellectually honest as I possibly can about the product. Steve: So, let’s say in the case of your Brush Hero project your click through rates were good, what is the next step? Kevin: Then it’s more of a true minimum viable product test, and then it was a matter of importing 1,000 of them, getting a low level video crew out to do some content development for us. And now we’re trying to spend a decent amount of money you know small figures, we’re not talking five, eight figures, but we feel pretty good about it. And in that case we often move to Amazon relatively early. I do not believe in Amazon as a product discovery engine. It’s great as an emporium and finding products that exist and finding niches and products within niches, but as a brand new product it’s not a wonderful place to be. However, being on Amazon early allows you to skip a lot of the infrastructure issues with getting a new product going. You can ship directly through Amazon multichannel fulfillment. So in a very lightweight environment you can slap up a Shopify store, you can ship some product to Amazon, you can connect your Shopify store via ShipStation or something else to Amazon and fulfill from there. Obviously now I have an infrastructure so it’s not as big a deal, but we use that same approach when we’re testing new markets. So before we went to Europe with some of these products, we did the same thing. We shipped just 500 or 1,000 units over there, stood up a site in German, did some German based direct response advertising, it worked great, so now we’re going to do seven figures in Europe, well we did seven figures in Europe last year. Steve: So you put these products up on Amazon, and for something like your product which is totally unique and people probably aren’t searching for it, how do you get some early exposure to that product on Amazon? Kevin: So as I said Amazon is a tough nut to crack with products like this. We use aggressive launching strategies like the Amazon pros out there well as far as getting early sets of reviews. We try and get as many legitimate influencers as we can to review the product, to get the product in their hand. We try and demonstrate sales velocity to the Amazon algorithm to help that rank. We target specific keywords. In the case of the brush, it was things like wheel brush or detail brush are sort of the key keywords that we needed to rank for. Steve: Are you doing this all through Facebook then or? Kevin: Yes plus we’ve developed networks of influencers that we can pull from. I’m not going to do that, we try to stick away from incentivized type reviews, but certainly people who have a lot of influence out there we’ll do disclosed influencer type things to get a product in their hand and get in front of blog post. And I’m not necessarily shy about using some of the Amazon tactics to rank for specific keywords. Steve: So regarding these influencers, provided that you weren’t in this niche before, were these relationships that you kind of developed during this whole process? Steve: Yes definitely during it. I’m a big fan of YouTube influencers and I think it’s a big opportunity for all of us in the space. I don’t go for big fish, I go for moderately sized fish out there, the people who are enjoying whatever the subject matter is, they have maybe tens of thousands of followers, but they seem to be on the upslope. And investing in them early on sort of a portfolio basis so you’re investing in a lot of them can give you opportunities as they grow and their audience continues to increase. Steve: So how did you find these influencers, do you use a service or do you just kind of go off on YouTube and look for them and just contact them directly? Steve: Yeah sure of course. Kevin: That I’m part of the tribe and they’re eager to help me out, and I don’t have to pay them very much money. I give them brushes and soap and what they need, and it’s amazing the sort of work they do. Steve: Can you just give me an idea of what the competition would be like for an influencer with like 20 or 30,000 subscribers? Kevin: So in your world I imagine that there are a lot of other type influencers who can be some of the toughest people to deal with in my opinion. They’re going to be mercenaries. We pay very little. Sorry if any of you are listening guys, but product sponsoring a race like giving like prizes for winners type things maybe $500. We’ve done a whole variety of things. We also have affiliate agreements that are set up with most of these guys. They really don’t yield a ton of indirect sales, but they make them feel incentivized to get our brand name out there, and we just run a private affiliate program that way. Steve: Okay. So while you’re doing these initial Amazon launches, do you have your own site up at the same time? Steve: And at what point do you focus some more energy on your own site and doing more direct response advertising for that? Kevin: Well pretty early. Once we’ve demonstrated the concept and feel that it’s going to work, when you’re going from four figures in investment to five figures of investment, I want to capture that customer. We have a considerably higher average order value on our own environment than we do through Amazon and we have the ability to remarket to those customers. One of the required elements of products that I’ll invest in is that it has some sort of a consumable element to it. So in the case of the brush it consumes the bristle, we have soaps etcetera, in our cooking lines there are some ices, there oils, there are other things that we can remarket to our customers once we form that relationship with them. Steve: I guess what I’m trying to get at is you’re working with these influencers and you have these ad campaigns going, like at what point do you — like it’s hard to focus on both, right, like if you go to an influencer, you tell him to either pick it up at Amazon or you’re outside. I guess you could include both links, but do you try to focus more on one channel than the other with your campaigns? Kevin: Generally we try as hard as we can to capture those customers. We’ve come to the realization internally though that we have an enormous bleeding over between our direct response advertising, Facebook, PPC, Pinterest. Anywhere our brand is being advertised, we have an enormous bleed off to Amazon. So we know that, we’ve internalized that and we’ve incorporated that into our success metrics and our advertising. So it would be tough to look at our direct Facebook results on a CPA basis and see enormous successes, but if you step back and you look at the enterprise and recognize that there are whatever 40% of people who added to cart bleed off to Amazon, we can be comfortable with an enterprise level cost of sales. Steve: Yes so what I was trying to get at is like you’re driving all of your ads to your own site and indirectly that kind of leads to more Amazon sales? Steve: Okay got you, whereas you never run ads or campaigns that drive traffic directly to Amazon? Kevin: I won’t to say never, there are a lot of circumstances that we do. If we’re employing ranking strategies we will. If we’re low on stock for instance in the holidays, we make a very deliberate move in the last couple of days to shift our advertising away from our sites to Amazon because Amazon is then responsible for fulfillment and customers will buy right up into the last minute. Steve: Okay. And in terms of when you drive ads to Amazon, do you do anything to kind of track those people or do you just send them straight to like your store page on Amazon? Kevin: There are a lot of different tactical ways of attempting to track those people, well the best known are the using associates’ links. We’ve had some success with that. It also gets a little bit hairy because it’s a gray area at best in the Amazon terms of service and we don’t really like to mess around with that if we can avoid it. So if we’re pushing traffic directly there, we will look at the Amazon conversion metrics. So we have a pretty good idea on a product basis what our conversion rate is the session percentage rate on Amazon and also the sort of traffic we get. So if we can correlate and we push several thousand clicks from Facebook to a direct Amazon link, how is that showing up in session percentage and can you get to a result there? It’s sort of a low yield analysis, but directionally we feel we can get a decent idea but it’s a hairy way to optimize campaigns for sure. Steve: Yeah so I mean basically you’d only do this if you’re launching or if you’re trying to rank for certain keywords, right, otherwise it makes more sense to divert the traffic to your own site where you can actually capture the customer? Kevin: And it’s pretty fascinating. We have some tools and techniques that allow us to assess our brand impression on Amazon that are readily available. And we can watch that over time and see how many people are hitting Amazon and typing in one of our brand names. And if you correlate that with off Amazon spend, you can correlate the two. But also over time it’s fascinating to see the organic development of a brand this way. Of course when we launch a brand, we get no links or just a couple from whatever the advertising is. Now even in periods of no advertising, we’re seeing hundreds of people that are typing in our brand name every day. Steve: How do you get that information? Are you just like buying ads on your own brand and getting statistics that way or? Kevin: No, it’s sort of highly technical. I think I’m going to go to decline that. Steve: I know. So Kevin you do really well on Amazon and your own site and you kind of expand it internationally, I’m just kind of curious why you decided to go into the whole retail space. I know you’re in Costco, maybe Home Depot, why the shift there? Kevin: So we’re in Costco and we’re in negotiations with Wal-Mart right now for a full rollout as well. We were fortunate in that with a niche product like the brush hero, in the case of both Wal-Mart and Costco the buyers were actually here and did our product by friends of theirs who knew what they did and said, hey this is a really cool product, you should check it out. The next thing you know we get a call from these guys. That’s not usually the way it works of course, but so first there’s just an opportunity that’s presented to you. In the case of Costco, the way that their system works is fantastic if you can present a value to their customers. Costco has an agreement with their members that they are willing to only mark up the physical products that they sell by 14.6%. So if you walk into Costco and you say, hey the street value of this bundle is $50 but we think we should give you an MSRP of $25 for it, Costco says, great that’s a huge value to our customers, we’re delighted. And then they have to pay you 21 or 20 or whatever that number is for the 86% of that that, that’s just the way that Costco works. Steve: Well, hold on time out, so their margin is only 14.6% off of the price that you give them? Kevin: Yeah. So that is the way that Costco works. They make almost all of their money on memberships. Kevin: So it’s a wonderful and this is all publicly available, you can check it out in their 10K. Their grocery [ph] business is different, but in the physical products it’s fantastic. So we’ll net, our gross revenue off of that $25 sale is $21 at Costco. Steve: So how do you determine what the price is? Kevin: So that’s a conversation with them. What’s most important to Costco is turnover and customer value, because in essence they make their money and this is all hearsay like what do I know about Costco’s mindset. But the way that it seems like they make their money is from their memberships and you see that in their financial reports. The way that they keep their membership numbers up is by offering excellent value to their members. So again if you have a bundle that if it were priced down in your website or Amazon or wherever else at $50 and you can price it at 40 to 50% off that, Costco feels that that’s a really strong value for their members and they want to present it as an opportunity to their members. They’re not really looking for that 14.6%, that covers their overhead. Steve: I just want to take a moment to tell you about a free resource that I offer on my website that you may not be aware of. If you are interested in starting your own online store, I put together a comprehensive six-day mini course on how to get started in e-commerce that you should all check out. It contains both video and text based tutorials that go over the entire process of finding products to sell all the way to getting your first sales online. Now this course is free and can be attained at mywifequitherjob.com/free. Just sign up right there on the front page via email and I’ll send you the course right away. Once again that’s mywifequitherjob.com/free, now back to the show. That’s very interesting. Okay so that means you make a pretty good profit selling to Costco? Kevin: Because they want to fill their warehouse and they want to show consumption. So if you pack wall to wall boxes of something into a crevice in Costco, they feel that it impacts the shopping experience. So they want to create a sense of scarcity. So if they’re only 75 units sitting there and half the pallet is already picked through, it encourages people to buy. And then the game is getting them more pallets as they need them. Steve: So what are some of the terms, like some of the details of the terms of selling to Costco, like do they expect a certain amount of volume from you and what do you need to — like what capitals do you need to have in place, how many units do you need to ship them and that sort of thing? Kevin: There are roughly 500 Costcos in the US plus another 250 internationally. Costco works — they have two different divisions. They have the US division and they have the international division, and they’re actually not really connected. So, if you want to sell internationally, you’ve got to sell to international people, and domestically you’ve got to sell to the domestic people. They want to see and it just depends entirely on the segment, they want to see X units that are being sold every week yielding Y dollars. And their seasons are really short. So our product will land in Wal-Mart in March and it will be totally gone by the 4th of July so it’s a very, very short selling season. But the goal is to replenish that pallet several times. In our case they want to see two or three pallets per store move through during that period. Steve: How do they know how well it’s going to sell in their store though? Kevin: So we did a trial last year just a few stores, 16 stores, and there were a lot of learnings all the way around about how the product needed to be priced and positioned and packaging and everything else. Costco is not for the faint of heart, I will freely admit that. The packaging requirements are absurd. Steve: Can you give some examples? Kevin: Sure, so our 75 unit pallet, at the end of the day we’re almost spending more on the packaging, the pallet, the pallet design, the [inaudible 00:32:57] packs than we are in the product itself, it’s very expensive. And it’s very expensive that small runs, it gets better at tens of thousands of units. But your test is pretty much a break even proposition at best. Steve: So they force you to use unique packaging? Kevin: Oh yes, yeah so you have to picture those big cards that they have in there. And again those are deliberately inefficient and they’re very expensive. So I think my cards are two layers of 24 point card stock with blister in between and there or whatever 14 inches wide and 13 inches tall, and then they have to have a customized tray set that they’re inserted into, and then the trays have to interlock so that they can be dipped double stacked etcetera, etcetera. Steve: Okay interesting. So given that Costco came to you, is that the typical way that it works or can you typically apply to Costco? I mean, I guess you aren’t familiar with the process outside of being approached, but do you know what that process looks like typically? Kevin: Usually you would you would be working with some sort of a seller group who has access to Costco and understands their needs, and understands how the whole thing works. I’m friendly with a bunch of these groups and they’re actually working with us. One group in particular is working with us for outside of Wal-Mart and Costco while we run [inaudible 00:34:30]. But they know the buyer at Bed Bath and Beyond, and they know the buyer at Kroger or whoever it may be. They know when the buying season is, when they’re designing their [inaudible 00:34:43] and what the requirements are. They give you a call and say, hey jump on a plane, we’ve got a meeting with Kroger, and you talk through the product with them. And we’ve done a lot of that too but yeah. Steve: How does the experience with Wal-Mart differ from Costco? Kevin: We’ve had an excellent experience with Wal-Mart so far, and I say so far because we haven’t — we’re in negotiations trying to figure out the whole thing. It’s very clear that the devil is in the details, that they have no tolerance for lateness or operational shortcomings or product issues or anything else. And the level of bureaucracy is impressive. In fact we’re trying to hire a person right now to be our retail channel manager who can help us through that process. I may not be dispositionally suited for the level of detail that’s required in that particular relationship. But they’ve been good to work with, they really have. Steve: But in terms of pure dollars, is the pricing structure similar to Costco? I would imagine it’s a lot different and your margins. Kevin: It is a lot different. So I can’t emphasize this enough that when you start thinking about retail, you need to think about price integrity. Once you set a price that’s up there in the wild other than retail, that is going to be your price. You set it too low and you can be leaving a lot a lot of dollars on the table. You set it too high; you won’t have the turnover that’s necessary to make these retailers happy. So that’s been an ongoing negotiation with all of these guys. I think intuitively for us, we feel that the direct consumer base price of our product is about $35, $34.99 which is sort of a strange number. I’ve always felt that once it gets going in retail it’s going to land around 29.99 but that’s pure margin, right? So we have to walk carefully when we’re thinking about that. But you’re exchanging margin for volume and it is substantial volume. Steve: Okay, can you just give us an idea of what is it like, a couple of orders of magnitude? Kevin: So Wal-Mart has 5,200 stores, I maybe making that number up but we’re talking about entering 3800 of them. The name of the game with Wal-Mart is definitely inventory turnover and small inventory numbers. So whereas Costco had 75 units a store, Wal-Mart may only be 46 units a store and they only expect to sell half a unit a week per store, because there are just so many, hundreds of thousands of skews that are in there, right? Kevin: So you have to be operationally prepared to be fulfilling small case levels to the Wal-Mart distribution system constantly. Steve: What happens with unsold units? I guess that’s less of a problem with Wal-Mart than Costco, but do they have the right to return you all the unsold inventory? Kevin: Everybody’s agreement is going to be different of course, but our agreements with Costco is a guaranteed sale, which means that if it doesn’t sell by the beginning of August they are welcome to ship what’s left back to us which is a substantial risk of course. We have figured out what are our breakeven point is, how many we need to sell and our comfort level with that. And at the end of the day, it doesn’t mean we can’t sell those products, magically a [inaudible 00:38:21] skew might appear on our page or be a special offer or something like that to get rid of that inventory. But the cash exposure, we’re obviously building for this order right now. We will be paying for it in the next 30 days. We won’t get paid for 30 to 60 days. You need to be prepared for that, and these are these are large numbers. So we’re entering sort of a new age for ourselves where we’re talking with trade financial organizations for factoring and trying to set up large lines of credit etcetera revolving credit. We’ve always been bootstrapped and we’re proud of that, but the fact is that the working capital needs of a wholesale organization are quite a bit different from those of a DAC [ph] organization. Steve: Yeah, I was just going to ask you the payment terms are sometimes on there are 60 days. Kevin: Yeah, 30 to 60 days. I have heard stories of Wal-Mart that it can be 60 days post sale. So imagine that. Steve: Oh man, that’s crazy. Steve: Right okay, that’s all negotiable I’m sure. Kevin: To be honest they understand that we’re a small organization, that we’re new to this, and they’re interested enough in the product that they’re holding their hand through. I like to joke that these buyers sort of seem like the kindly uncle who makes no bones about the fact that you know haul you out to the woodshed and shoot you if things go wrong. But I mean they’re open about it, they really are, and it’s appreciated. They’re not trying to hide anything, they’re just like we understand that this is a big operational burden on you, these are the things you must do. And if you fail in these it will be very bad, so don’t fail please. Steve: So again let me ask you this, I mean your B2C business is doing really well, you’re in Wal-Mart, you’re in Costco. I was just kind of curious what your motivation was for going on Shark Tank. Was it just to be on TV; was it just to get to know the sharks? Kevin: So the Shark Tank process is really long. We first applied early last year and the process went relatively quickly for us, but it still took months and months and months. And when it looked like we were actually going to get on, we looked at each other, my partner and I, and said, well what do we really want out of this, what are we really doing? And I think first off, they can smell people who are after publicity from miles and miles away. So you’re not ever going to get to meet the sharks if they don’t think that you’re going to be either super entertaining or willing to take a deal. So we internalized that, we decided, okay, getting in bed with one of these guys could be really useful to us, the brand cache, the connections, flat out money. So we came up with a figure that we’d be willing to take and the amount of the company that we would be willing to give away and per my MO we wrote down on a piece of paper, and then if you watched the show we clearly ignored that. Steve: Yeah, I did see the episode. I’m just curious, when you came up with that number, did you account for the fact that they would counter offer something significantly worse than your offer? Kevin: I mean I honestly feel that our valuation is quite good given our net revenue and our trajectory, and especially where we’re heading in 2018. I think that their counteroffer was ridiculous, but you take that into account when you’re sitting there thinking about what Lori Greiner could possibly add to your business. I have no illusions about the fact that she would be personally involved in it. She won’t be, but she has an infrastructure and she has a machine that’s working with her as a statement, and that should accelerate things. Steve: How do you factor those in your calculations, like how do you estimate how much business like a shark will bring you in your calculations? Kevin: You’re giving me too much credit. Steve: I’m just kind of curious what your process is. I mean it seems very wishy-washy to me. Kevin: Yeah I’m pretty analytical of course, but in this case, gosh, you think about the value of seven or eight men and it’s on ABC at prime time and getting the brand out there. Even if it goes — well as long as it doesn’t go poorly from a product perspective, the brand is getting out there and people will see it. So there’s of course a marketing opportunity to it. In terms of capital, we asked for $500,000 and $500,000 I can tell you would be useful right now as far as our inventory financing is concerned. The valuation was low but it wasn’t completely out of sight. So it’s hard to say right. In retrospect had I taken the deal, I think I would have felt like I gave away too much of the company, but yeah they’re super intense. It is filmed like live, it’s not actually aired live, but there aren’t cuts or anything, like you’re out there and you’re out there for a good hour and going back and forth with them and it’s intense. Steve: I mean you were portrayed very well on the show unlike one of my buddies who got roasted. He is actually on the podcast, and he got roasted by Mr. Wonderful. But I’m just kind of curious like how did being on the show, just being on the show, how did it affect sales? Kevin: It’s been good. We do have a hose mounted product right. And I’m looking out my window here in Utah and I have 18 inches of snow out here. So these are frozen right now, so the airing time January 21st was not ideal for us. It would have been really, really great had it been March or April right when people are starting to think about cleaning. We did screen captures of our simultaneous sessions and we got up into several thousand people all on the site every time it aired. So it was on the East Coast and it airs Central or Mountain Time, then it airs on the Pacific. So you really get three airings in one night, and each time we had spikes of several thousand users. And we did well, we did well. It wasn’t like a complete home run, we’ve certainly had better days especially around the holidays, but it is a gift that keeps on giving particularly on Amazon. Our Amazon sales are excellent right now and we’re literally getting 700 to 1,000 individual brand searches a day on Amazon which is great. So that’s converting well. And I think it will pay dividends when the products hit retail shelves. Brand building is one of the hardest things you can do, what is Brush Hero; nobody knows what Brush Hero is. But now seven million people have at least sort of experienced it. So as they brush through the aisles of Wal-Mart, they’ll have an idea of what it is, and that can only help. Steve: Yeah absolutely. I was just kind of curious like whether the sales bump kind of just lingers or whether it was just spiked when the show airs for you. Kevin: It definitely lingers. The way that people watch TV these days, it’s just different right. Every single day there are x number of thousands of people who DVRed [ph] and haven’t watched it yet, my own wife hasn’t seen it yet. Steve: That’s okay; my wife doesn’t listen to my podcast either, so it’s all good. Kevin: Oh so you’re on national TV yeah. Steve: Yeah, so I mean so overall the Shark Tank experience even though you didn’t get a deal was very positive, and if you got the deal it sounds like you probably would have regretted the terms that were given on the show in some way? Kevin: Certainly with my own terms, the final terms were ridiculous. The main terms that we made a tactical error and left the tank, I think we could’ve lived with those. Both my partner and I are experienced enough in the investment community that I think that in diligence we could have worked a good deal and we could have ensured that they would be heavily involved. I like to say that, who knows how it was laid off. But all in all, absolutely a positive experience. I think most important for us was making the product look decent and it did. The fact that two of the sharks were willing to invest $500,000 validates the product. The fact that we ended up looking a little maybe slow is okay, that’s fine. We’re human and it humanizes the company a little bit. So yeah, I have nothing but positive feels. Steve: I know. I thought you guys came across great actually. So, yeah for sure. Kevin: I will say that that there are posts on the Shark Tank Facebook page, one of which has a picture of me and a quote below it that says, never leave the tank. And there are like 18,000 comments which of course are really warm and friendly, and supportive for us. Steve: Yeah I’m going to have to post that episode right below on the show notes actually so people can actually know what we’re talking about here. Kevin, before we end this interview can you just tell people where they can find you, where to buy your product or look at the product? Kevin: Sure I will, brushhero.com, Amazon, all well brushhero.co.UK.eu etcetera. Our second product is the elevated cook, so elevatedcook.com, that when just recently launched. Steve: What is that product? Kevin: That is an elevated chicken roasting rack. So it allows you to essentially rotisserie a chicken without a rotisserie. And that patent is held by one of the White House cooks. So the last four presidents have been fed off of my product. Steve: That is really cool. So did you get to go to White House? Kevin: I don’t think the White House knows that I’m combining spices in their basement. I guess they do now, I’m kidding. Steve: Oh hey Kevin, I really appreciate your time coming on the show, a really interesting story. Thanks a lot. Kevin: Cool, thanks a lot Steve. Hope you enjoyed that episode. What I love about Kevin’s methods is that they seem really obvious and intuitive but most people don’t do it, and we should all be applying his strategies. For more information about this episode, go to mywifequitherjob.com/episode209. And once again I want to thank Klaviyo for sponsoring this episode. Klaviyo is my email marketing platform of choice for ecommerce merchants, and you can easily put together automated flows like an abandoned cart sequence, a post purchase flow, a win back campaign, basically all these sequences that will make you money on auto pilot. So head on over to mywifequitherjob.com/K-L-A-V-I-Y-O, once again that’s mywifequitherjob.com/K-L-A-V-I-Y-O. Now I also want to thank Privy for sponsoring this episode. Privy is the email capture provider that I personally use to turn visitors into email subscribers. They offer email capture, exit intent, and site targeting tools to make it super simple as well. And I like Privy because it’s so powerful and you can basically trigger custom pop ups for any primer that is closely tied to your e-commerce store. If you want to give it a try, it is free. So head on over to Privy.com/Steve, once again that’s P-R-I-V-Y.com/Steve.